I was a "Charter Subscriber"
and I savor (and save) each copy. They showed it as a casual table scape. 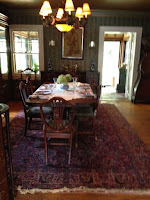 They showed it as an Elegant table scape. 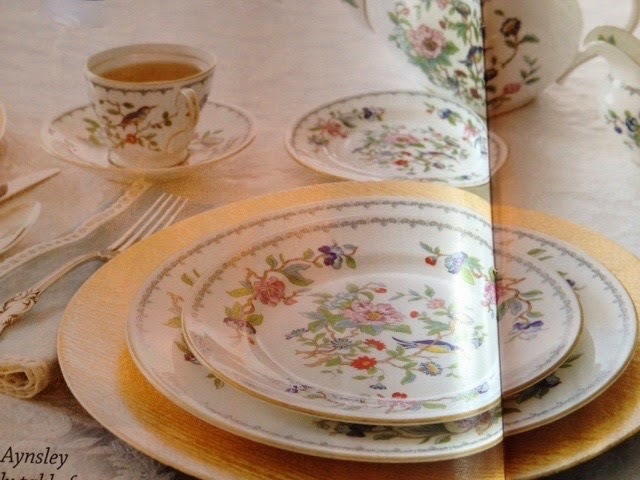 Ansley's pretty Pembroke pattern has been around for 30 years, a respectable age for any china pattern. But this delicate design of bluebirds and pink camellias is actually based on a pattern that was created much earlier, when founder John Aynsley was still at the helm of this 240 year old china company. Pembroke reflects the 18th century fascination with birds and exotic plants newly imported from Asia. I beg to differ on the 30 years. For it was closer to 40 years ago that I first saw Pembroke at Thomas Pharmacy in Nevada, Missouri. Half was a pharmacy and half was a gift shop. An elegant gift shop. 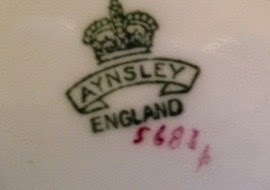 For the brands it carried were Wedgwood and Waterford, Aynsley and Noritake. In those years, it was the place where brides went to register their patterns. I'd look at the china and dream about Pembroke. I loved the 18th century style of it and thought it one of the most beautiful patterns ever. But I never bought any. Above, we've set a classic tea table with Pembroke. A white damask tablecloth echoes the floral motifs on the translucent bone china plates, and blue napkins, trimmed in lace, pick up the pastel shades of blue and green in the bluebird that adorns each plate. And with my Pembroke, I set a duplicate table. A few years ago, I found some Pembroke on eBay and bought it. for the Wedgwood left home when Daughter Sarah married. something for her wedding and then getting the Runnymede . . . later, we gifted her with the Wedgwood as her engagement present. So when I found some Pembroke on eBay, I decided that I still loved the pattern as much as I did in the 70's. And I bought it! Last year, last January, actually, a friend and I went to the town 40 miles east of here. we stopped at a smaller flea market a block or so off the highway. Eight plates, 8 cups and saucers, 8 salad plates, 8 bread and butter plates, 3 cream soup bowls and saucers and 8 fruit bowls. And I passed it by! 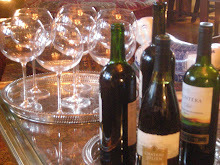 But I had been cleaning, my china cabinets were full. And what did I need with all that china! 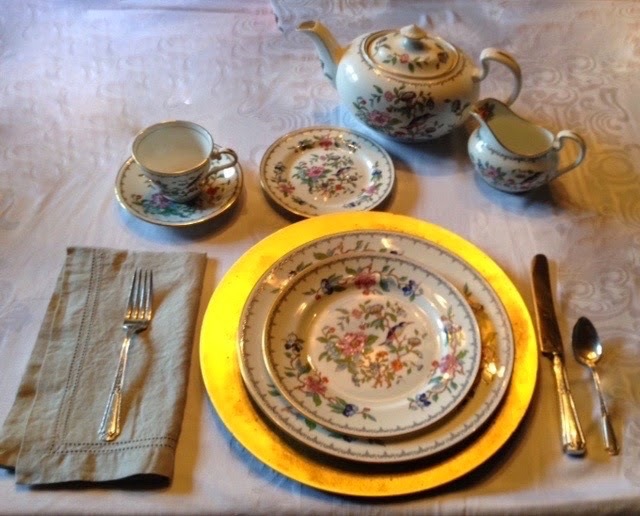 For I had grandmother's Noritake as my "good" china! And so the next week, I went over, determined to buy. If it wasn't there -- it was meant to be that I not have it. Well, I may have just gotten the china deal of the century! And it came home with me! They're almost 100 years apart in manufacture! While on the older it is on the inside! it's often listed under 5683.
it's my pattern of choice! And I do favor the older cups. Something about getting to the bottom of your cup and finding the bird inside! And we have more Pembroke at Linderhof . 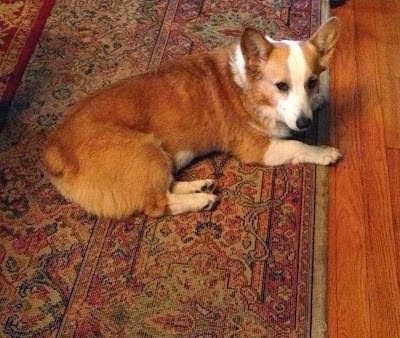 . .
perhaps my love of Pembroke Corgi's fuels my love for Aynsley's Pembroke! It's Thursday, and I'm sharing my Pembroke with Susan at Between Naps On the Porch for Tablescape Thursday. I think this is the first time I've set a table and haven't eaten off of it! 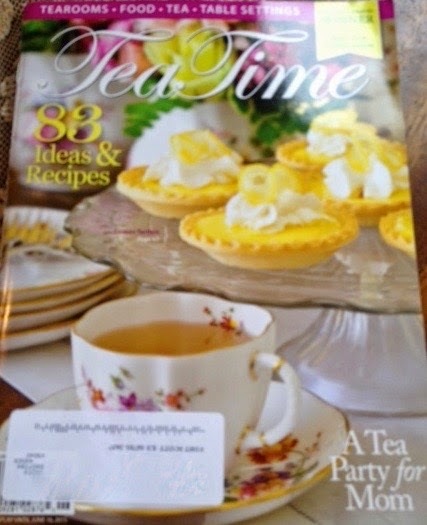 But it was fun to recreate the layout in Tea Time Magazine! What a truly interesting and educational post! I love both of them too - have a thing for birds - have seen this pattern but never personally, just pictures. 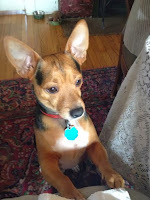 How I would just love to be one of your guests for tea time! What a wonderful story. Who would guess the same pattern would be manufactured so many years later? 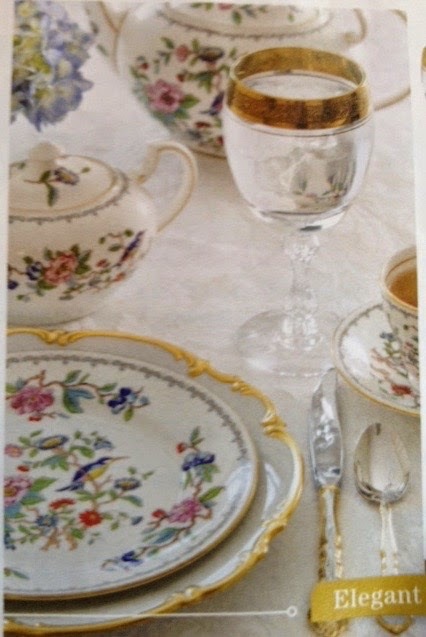 The china is perfect for afternoon tea, such a civilized practice. 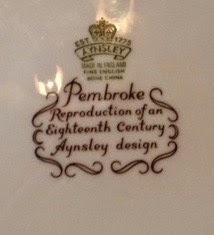 So glad you got your beautiful Pembroke china at last! Enjoy using it as much as you can. Gorgeous! 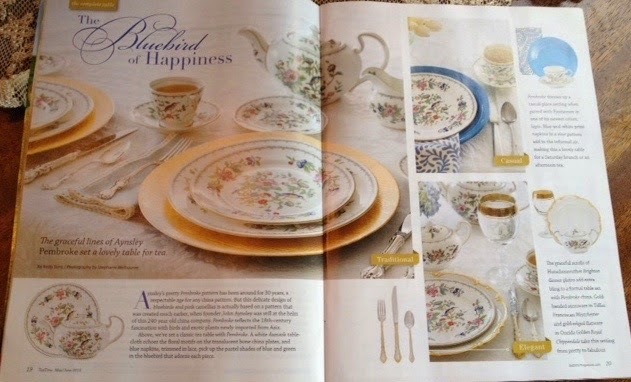 I did notice that article in Tea Time and thought the set there was beautiful. 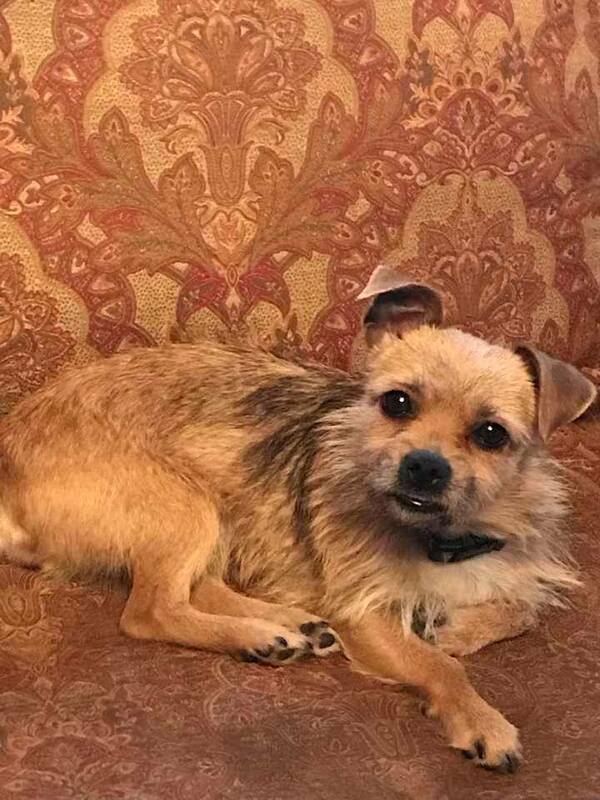 Hi, I love your post on Pembroke! 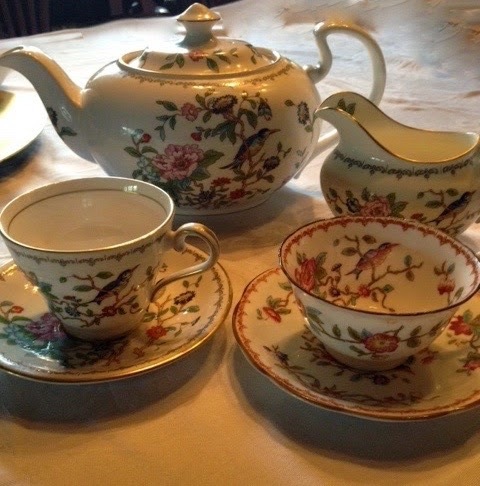 I have had amy set of Pembroke for more than 30 yrs. 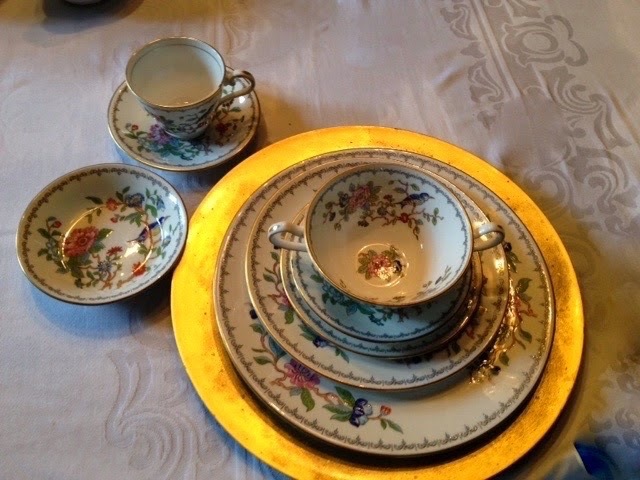 We found this set at Linz Jewelry at North Park Mall in Dallas when were closing their china department. It was a fabulous sale. Then my parents bought the tea and coffee set in England, We found another gift shop in Dallas closing out a hugh amount of extra pieces for unbelieable prices. 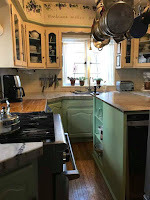 We have bought many more pieces over the years while antiquing! It is one of my largest sets I have collected over the years. I stilll enjoy the set and how you have brought back great memories. My husband and I are the couple who visited your city about 3 years ago and loved its fort and downtown. Such a great story and love both sets! 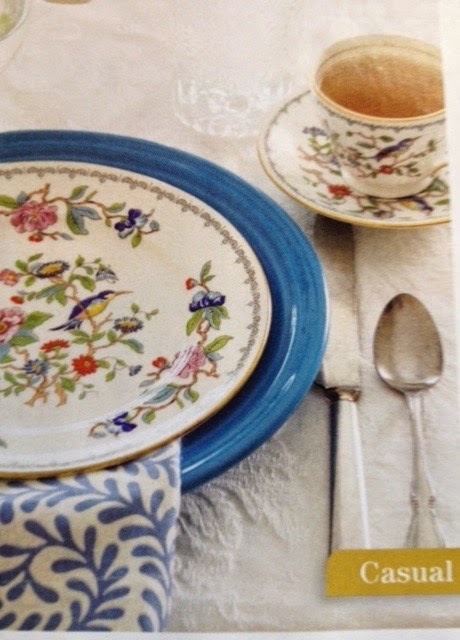 By the way, your place setting is prettier than that in the magazine.